In November 2018, Beryl Marchand set out to do some food shopping at her local Market Basket in Salem, New Hampshire. Around 12pm, a woman who was also shopping noticed that Beryl seemed to be having trouble trying to get out of her car in the parking lot, and notified the store manager who called 911. Upon the Salem first responders' arrival, it was apparent that Beryl was having a stroke. She was taken to Holy Family Hospital in Methuen, under the care of Dr. Eric Cirino. Dr. Cirino quickly noted her to be aphasic (unable to speak) with left sided gaze deviation (abnormal eye movement) and right sided weakness. He diagnosed her with left middle cerebral artery occlusion, which is considered a severe stroke. Beryl was taken to Boston Medical Center by MedFlight, and placed under the care of Dr. Hugo Aparicio, Dr. Sharjeel Panjwani, and Dr. Thanh Nguyen. She was brought directly to the neurointerventional suite, and the clot was successfully removed 47 minutes later. Since that day, Beryl has made a remarkable recovery. After her stroke, she completed a two week inpatient stay Northeast Rehabilitation prior to returning home. At 90 years young, Beryl has been able to resume all of her normal activities, which include cooking, walking, driving, (and even shoveling her snowy driveway!). Her speech has also made great progress and she is now more in tune with conversation. 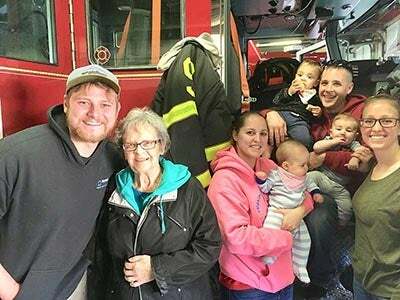 Beryl is now enjoying the loving company of her two sons, six grandchildren (two of whom are firefighters), and ten great grandchildren. 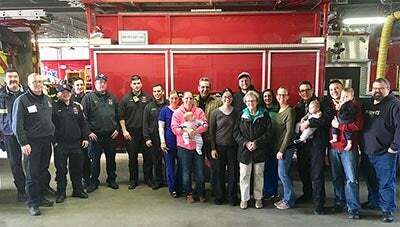 She paid tribute to Salem Fire and the Holy Family Emergency Department team in December, in gratitude to the first responders and medical providers for their excellent work. She is forever grateful to her BMC care team as well. For more information about stroke care at BMC, visit www.bmc.org/stroke.